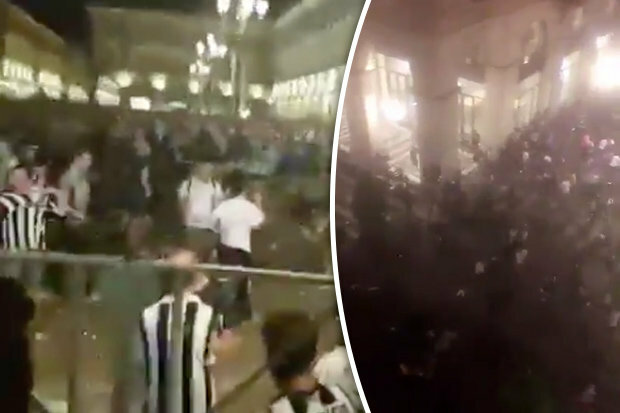 AN “explosion” has been reported in a Turin square being used by Juventus fans watching their team in the Champions League final. Footage has appeared online appearing to show people running from the San Carlo piazza, one of the Italian city’s main public squares. Police lights could be seen flashing while the sound of fans calling each other can be heard. People have reported seeing football fans stampeding from the square. Several people have been reported injured due to crushing as thousands of fans tried to flee the area. A witness told La Stampa newspaper: “We heard a bang and everyone started to run. “We heard screaming and at one point thousands of people began to press to run off the square. “We were all overwhelmed, there are children who lost their parents and relatives. Early reports vary on the source of the “explosion” with some suggesting the noise was a banger that spooked fans.